This has ‘gimmick’ written all over it, but unlike most things that look gimmicky, this actually does something useful. 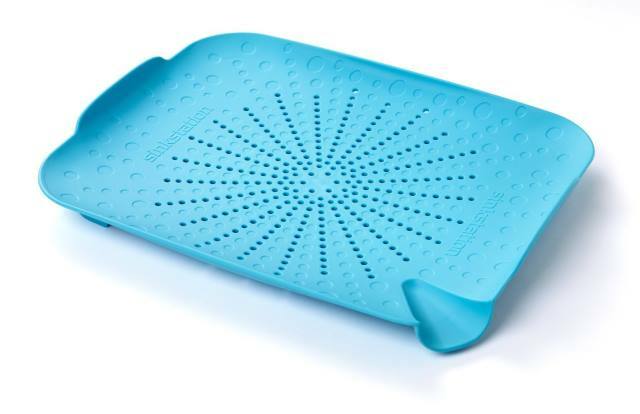 The SinkStation bills itself as a ‘flat colander’, and the general idea is that it’s a largely flat sheet with drainage holes in it that sits in the sink and does the job of making the bottom hygienically usable for food preparation tasks. It also provides a way of rinsing out flat, delicate foods, and a place to catch peelings and other stuff more cleanly. It sounds a little far-fetched, but it’s a good idea – a raised ‘deck’ at the bottom of the sink to keep food off the bottom as its drained or cleaned. It does the job pretty well, and is great for draining small amounts of boiled things, like pasta or potatoes … there’s a spout shaped indent at one corner that helps to guide water away that also helps to direct the cooked stuff when it’s tipped out. The same goes for the movement of peelings/assorted debris to the bin. It’s not a bad idea – tough plastic that survives the dishwasher, easy to store, comes in a galaxy of colours, multifunctional and versatile.